With the theme “When I am weak, then I am strong.” (2 Corinthians 12:10), the North Luzon Highland District-Lutheran Women’s League (NLHD-LWL) gathered for its 39th Annual General Assembly last May 10-13, 2017 at the United Lutheran Church (ULC), Pico, La Trinidad, Benguet. The assembly started with an evening devotion led by the Rev. Denver Dagano on the day of the arrival of delegates. The next day was opened with a morning devotion followed by the introduction of delegates from the different circuits. 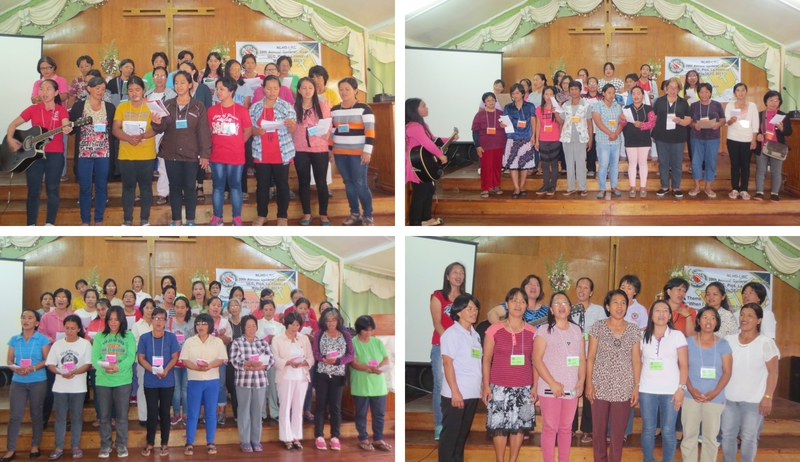 A total of 150 women attended this momentous assembly consisting of 24 circuit representatives from Mountain Trail, 24 delegates from La Union, 20 delegates from Nueva Vizcaya, 34 from ABANTIKA, 7 from Mountain Province, 24 from BLISTS, 9 from KAIQUI and 8 from Kapangan-Kibungan. The Rev. James Palangyos, Pastor of ULC, delivered his keynote message focusing on the theme. Bible studies were divided into three groups according to age bracket. Ladies ages 29 and below group was led by Rev. Mateo Cupas, 30 to 45 by Rev. Dennis Alida, and 46 and above by the Rev. James Palangyos. After lunch, Rev. Alois Schwarz, visiting German professor at the Lutheran Theological Seminary in Baguio City shared on the Women-during the Reformation. Mrs. Aurora Mansilla gave an orientation on Trauma Healing. For group dynamics, the delegates were divided into four with color assignments as follows: blue, yellow, pink and orange. Before dinner, the delegates were given time to have a group meeting and practice for the “Women’s Got Talent” activity scheduled for the next day. The first day of the assembly was ended with an evening devotion led by the Rev. Guiller Pagaduan. The yellow, blue, orange, pink and green team (Deaconesses) as they sing in the Chorale Competition of NLHD Women’s General Assembly 2017 held in United Lutheran Chuch, La Trinidad, Benguet. The afternoon session was filled with cheers as the women enjoyed group games such as Bible Drill, Bible Trivia and Women’s God Talent on Solo, Duets and Chorus musical renditions by group. The 39th Annual General Assembly formally ended on May 13, 2017 with a closing devotion led by the Rev. James Palangyos after which the delegates bade tearful goodbyes to each other.